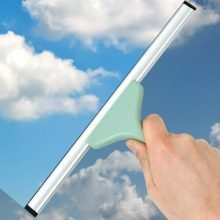 Our window cleaning services can be delivered the conventional way or using our high-level water-fed pole window cleaning system. When we use our pure water cleaning system all frames and sills are also cleaned. On completion of cleaning, windows dry to a spotless finish without the need to wipe off contaminants. We do not use any detergents. Employ us in the knowledge that there is no risk from ladders as even the most inaccessible windows can be cleaned using our state-of-the-art system. 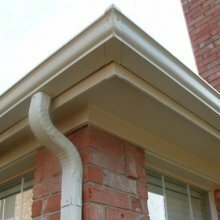 Unsightly deposits that are particularly noticeable on gutters, downpipes and soffits can be effectively removed by Cleaning Doctor using state-of-the art cleaning systems and safe cleaning solutions that won’t damage your property with excessive pressure washing. Around ventilation covers, we use gentle brushes and the minimum water pressure required to avoid water ingress. 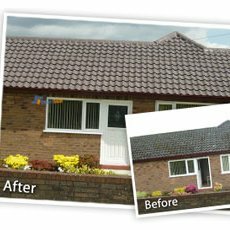 If you are looking for a reputable and reliable external cleaning company to give you a free, no-obligation just give us a call. Through time, airborne pollution and adverse weather even the cleanest of buildings will collect dirt, grime, mildew and red/green algae. This can be particularly noticeable on walls. 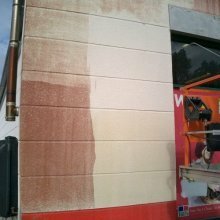 These unsightly deposits can be effectively removed by Cleaning Doctor leaving walls looking as good as new and sensibly costed too. 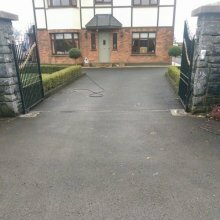 At Cleaning Doctor we cater for all types of driveways. We can clean and restore tarmac, concrete, imprinted concrete, block paving, mono block and more. 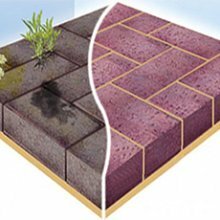 Before cleaning, in many cases we will apply a fungicidal wash, especially if moss is present on areas like tarmac driveways. in many cases driveways will look as good as new. Cleaning is then completed using our Power Brush cleaning tools which create NO damage to the surface being cleaned. You’ve probably paid a lot of money for your solar panels to increase your financial reward, however many homes and business owners don’t maximise the return by neglecting to keep them pristine clean, which in turn minimises the amount of energy generated. Panels are no different to a windscreen on a motor-vehicle, the windscreen gets dirty with soils because of inclement weather conditions that we have in our area. To Maximise visibility you switch on your wipers. 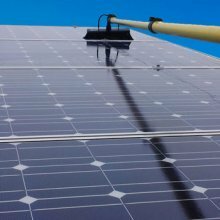 To Maximise efficiency on a solar panel the panel needs to be immaculately clean. Grime, dirt, algae and mildew can make your property look tired and run-down and indeed in many cases leaves it unsafe for anyone using it. Whether it’s patio cleaning or pathway cleaning we have the expert knowledge, cleaning solutions and equipment to quickly and without mess or fuss leave it in pristine condition. When a jetty or a wooden decking is left un-treated, moss and algae often begins to grow on the surface, which can take away from the overall look. However, not only is it unsightly, but the resulting slippery surface, when wet, can be very dangerous. Cleaning Doctor first treats the surface with a cleaning agent and then pressure washes it with a rotary cleaning head that cleans every groove without leaving any marks, like some normal jet washers do. 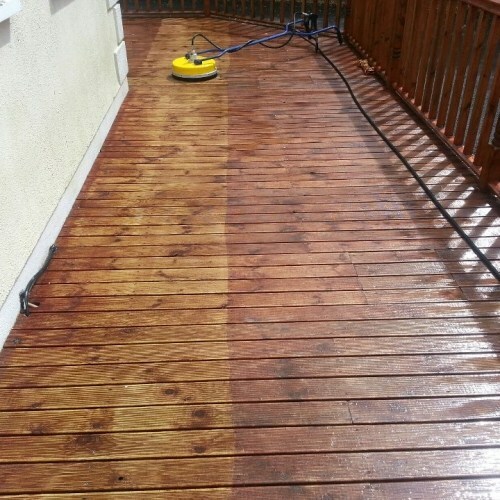 Once the surface is fully dry, the freshly-cleaned decking can be treated with a sealant or protective coating to protect it from the elements. The exteriors of many buildings are ruined by the appearance of various algae, moulds and mildews. These microscopic growths come in various colours, including red, green and black. They are encouraged in their invasion by a damp climate and the lack of regular cleaning. In many cases water alone will not deliver effective cleaning results, however we at Cleaning Doctor have formulated a cleaning solution that will totally restore surfaces with unsightly red, green or black algae or staining. The results are amazing. After thoroughly cleaning a surface, Cleaning Doctor usually recommends that a porous surface be sealed with a high quality sealer. SmartSeal superior surface protection is one of the preferred products, which are all manufactured to ISO 9001/BS5750 standards. 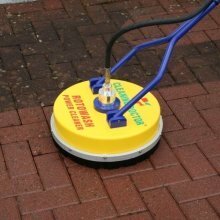 The sealers provide longer lasting protection for a wide variety of hard surfaces such as block paving, imprinted concrete, tarmac, paving slabs, natural stone and roofs. Your home needs maintaining in the normal way, and this general advice may be useful when read together with your HomeBuyer report. It is not specific to this property, and does not include comprehensive details. Problems in construction may develop slowly over time. If you are concerned contact a chartered surveyor for further advice. You should check the condition of your property at least once a year, and also after unusual storms. 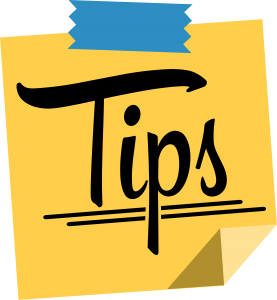 Your routine re-decoration of the outside of the property will also give you an opportunity to closely examine the building. Call Cleaning Doctor Tommy Conlon today! 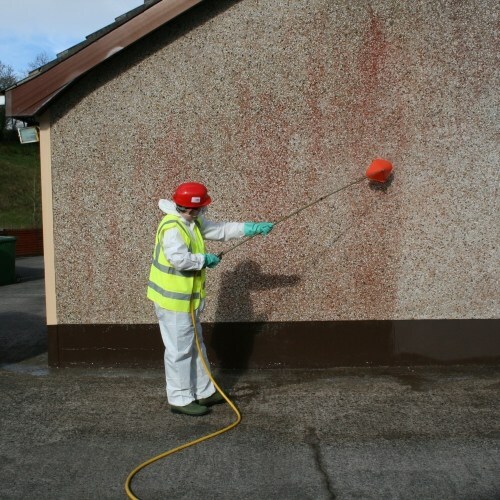 Cleaning Doctor External Cleaning Services Antrim, Ballymeana & NE Co. Antrim is a Cleaning Doctor business owned and operated by Tommy Conlon.